• Baseball’s Greatest Scientific Coach: Read about all the amazing concepts, tools Jerry Weinstein has learned about during a remarkable 59-year career. • Special Report: Inside look at how Riverdale Baptist H.S. (MD) has posted a 1,103-262 record over past 41 seasons. • NCAA Approves Bat Testing: NCAA Playing Rules Oversight Panel approves in-season bat testing for NCAA Div. I schools in 2020 and NCAA Div. 2-3 institutions in 2021. • Vanderbilt Wins Recruiting Title With Amazing Class: Commodores land 17 freshmen led by 10 remarkable pitchers. Top 40 teams in USA listed which includes rundown on top 25 classes. • What Deception Is In Pitching: Perry Husband explains all the nuances of what deception as he delves into why hitters are able to hit pitches hard and other times have a tough time of it. It all boils down to an Effective Velocity tunnel, ball spin/speed, hitting swing time, plus more. • Editorial: Wireless pitch calling isn’t the final answer in speeding up games. A 20-second pitch clock must be used with men on base along with an emphasis of hustling all the time in games. • What Should Second Baseman Do? : With ball hit back to pitcher who will throw it to the shortstop on a double play, should second baseman back up the shortstop or stay put and have centerfielder back up? Read the intriguing answer in a classic column by John Herbold. • Brad Miller On Hitting: Linear and rotational hitting vital in quest for hitting excellence. • Justin Dehmer: Quality at bat percentage is a much more important stat for hitters than simply looking at batting average. • John Kolasinski: ABCA Clinic Chairman for 2018 Indianapolis Convention explains who the clinicians will be at the 74th annual event along with other important items on the agenda. • Jack Dunn: Multiple drill combines base stealing with defensive skills. Read about how this progressive drill can help teams improve dramatically in both of these areas. • Life In Cuba Was Living Hell: Elvis Dominguez, head coach at Bradley University, witnessed an execution at a young age and saw everything taken away from his mom and dad when Fidel Castro’s communist regime came into power. • Superb, New Products: Innovative baseball tools are listed that will help players perform at a higher level. • High School Notes: Archbishop McCarthy High School (FL) fined nearly $16,000 and must forfeit all of its 2017 regular-season games (22). • Ken Schreiber Dies: One of the top high school coaches in history at La Porte H.S. (La Porte, Ind) passes away at the age of 83. • Ruleball With Rich Marazzi: Batter interference plays worth close inspection. • Upcoming Instructional Clinics: Here is a rundown on scheduled clinics across the USA. • Charlie Greene: Supination pitches can be taught for maximum protection. • Phil Swimley: Pitching sequences of Mark Prior and Juan Marichal explored which sheds more light on problem issues with arm injuries. • Brian Cain: Controlling how you respond to adversity crucial for athletes. • John Pinkman: Is accuracy a problem? Try these interesting fixes that are uncovered with high speed video. • Product Discounts! 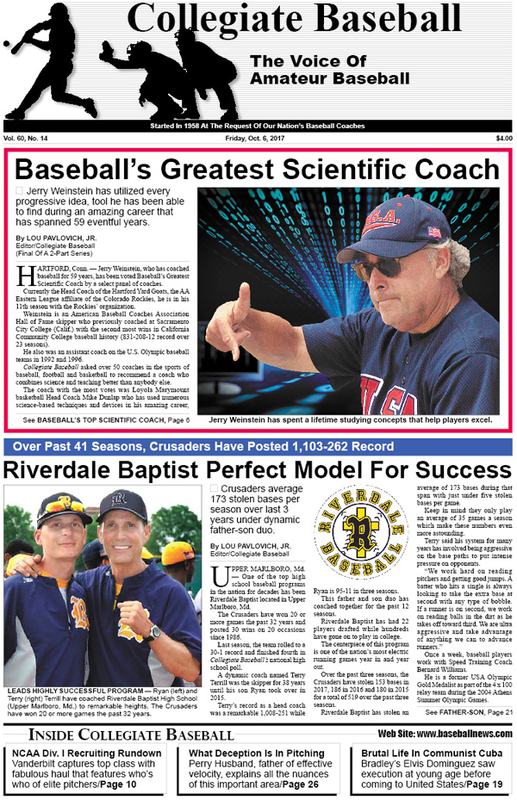 : The pages of the Oct. 6 edition is filled with ads that offer special discounts for Collegiate Baseball readers. To purchase the Oct. 6, 2017 edition of Collegiate Baseball or subscribe, CLICK HERE. Subscribers always receive one of our e-books FREE! Our latest is Secrets Of Pitching which is a treasure trove of information.